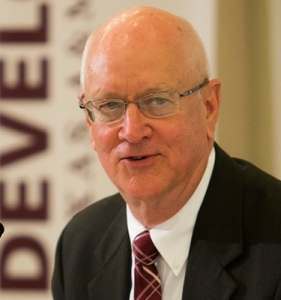 As Howard G. Buffett Foundation Chair on Conflict and Development and director of the Center on Conflict & Development at Texas A&M, Dr. Price leads research, teaching and development on fragile states, including Iraq, Afghanistan, South Sudan, the Democratic Republic of the Congo, and other conflict affected regions. Until recently, as founding director of the Norman Borlaug Institute for International Agriculture, he led international programs for seven Texas universities and 13 statewide Research and Development centers, and six state agencies, including $75 million in grants and contracts. Price was the lead author and advocate of the Federal Famine Prevention and Freedom From Hunger Improvement Act of 2000—legislation linking global economic development to state and local interests. He led US Agency for International Development teams to evaluate or design development projects in Ethiopia, Bangladesh, Jamaica, India, Indonesia and the Philippines, and conducted numerous development consultancies in Africa, Middle East, Latin America and Asia. He has also managed institutional contracts with the World Bank, US Agency for International Development, Asian Development Bank and the InterAmerican Development Bank, and client nations. After answering President John F. Kennedy’s call to serve his country as a U.S. Peace Corps volunteer in 1962, Dr. Price received his undergraduate degree from Yale University and completed his masters and doctorate in Agricultural Economics at the University of Kentucky.